Ranking higher in local search results is not just about the organic search results in blue text. At the top of the search results page, Google shows the top 3 listings in that area for that user. If you are in these top 3 search results, you have a much higher chance of getting clicks, phone calls, and customers. To optimize your business to appear in the top 3 search results, we have to focus on creating citations, which are also known as business listings. This is one of the most important ranking factors for local SEO in Google’s algorithm. 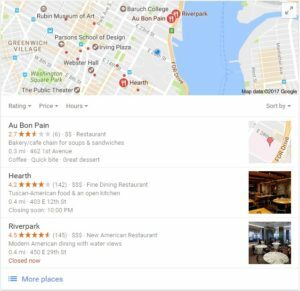 Note: This is to rank higher in the “3-pack” of Google Maps search results (your Google My Business listing). Choose which keyword is the most relevant and highly searched for your business. Find the top 3 competitors that show up for that keyword. Find which citations these competitors have. Collect the list of website citations and report which websites they are from, their domain authority. Report Moz’s recommended list for this business category. Create a list of recommended business listings sites that we should create listing for in order of the most effective sites. Report on any existing business listings as well as any duplicates, inaccurate name/address/phone number. Provide a final strategy and action plan. Create citations and business listings. Fix any inaccurate business listings.